Last time I spoke about Empathy, I was a little disappointed in the project. I really liked Pidgin and it felt like they were being stabbed in the back, even if everything the Empathy team was doing was koser GPL-wise. At the time I didn’t give it a second look because it was still missing a bunch of features. 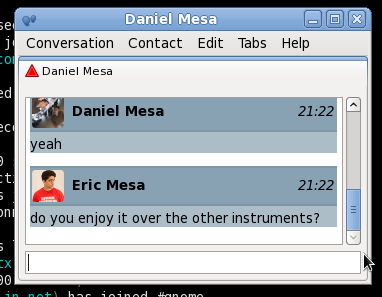 It’s been 2 years, or 4 releases of Gnome, since then and the project has come a long way. It now supports all the protocols that Pidgin does (and more) and everyone seemed to think it was doing a better job of listening to users, etc. Now, this shouldn’t make a huge difference unless I missed something, but I’m reviewing 2.30 as Fedora 14 hasn’t come out yet. I’m sure there wasn’t a massive upgrade or anything. So, first of all, here’s what Pidgin looks like. The screens looked really nice. And so my buddies appeared. The facebook account was not included. At first I thought it was because Empathy lacked support for Facebook which would have been a deal-breaker considering that Pidgin can do it and there’s no reason to abandon Pidgin. I just went into the accounts page and found it there. Empathy doesn’t appear to have a plugin architecture. Or maybe it’s hidden somewhere? I don’t really care. The only thing missing is Markerline (which it does via timestamp), text replacement (actually really useful) and Pidgin-Rhythmbox, which never worked for me anyway. So, one I’d miss. Interesting thing here with History mentioned there. I searched through all the options available in Empathy and I couldn’t find a way to disable logging. This doesn’t matter as I always have logging enabled in Pidgin as it makes looking for stuff I’ve said easier. But I know some people for whom that would mean they would definitely use Pidgin over Empathy. I’m sure there’s some gconf setting that controls that, but I think it should be exposed to the user. I checked the included help and couldn’t find it. 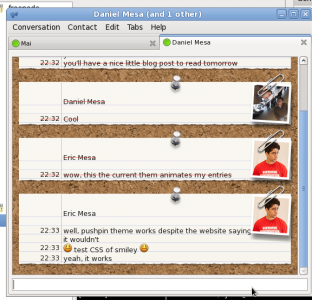 So, let’s check out some of the Adium themes I thought were neat and which are confirmed to work with Empathy. Too bad it doesn’t tell you how to change them in the help menu. You have to go to the website and it tells you what to do. I d/l them and put them where the website told me to. Yay, they appeared in the list. One of them, Pushpin, was listed to fail but I wanted to try it anyway. Empathy - SNES Final Fantasy with sprites! I guess this is what it does when you don't have an avatar? It looks much better this way! I decided to go with Final Fantasy for now because, as Dan knows, they hold a special place in my nostalgic heart. But I think I’ll probably end up going with pushpin. So, are any of these compelling reasons to switch to Empathy? So far I haven’t found one. Right now they’re more or less equivalent. 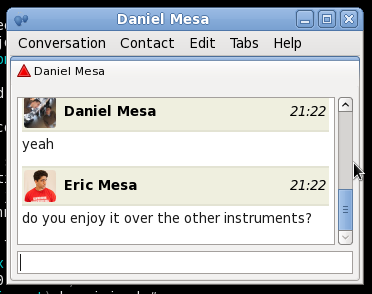 So just use whatever your distro has as the default. Right now the important use cases for Pidgin are if you need off the record or the other encryption plugin, if you don’t want chat logging, or if you also use it on Windows and want a consistent experience. I’m going to use Empathy for a while and see if I end up pining for something from Pidgin or just stick with it. I’ll post an update here. Reasons for/against using one or the other welcome in the comments. Tweedle Dee and Tweedle Dum Costumes Popular this Year? So you’re always logged into Facebook chat? That sounds awful. It’s a lot less awful than having to be logged into Facebook. 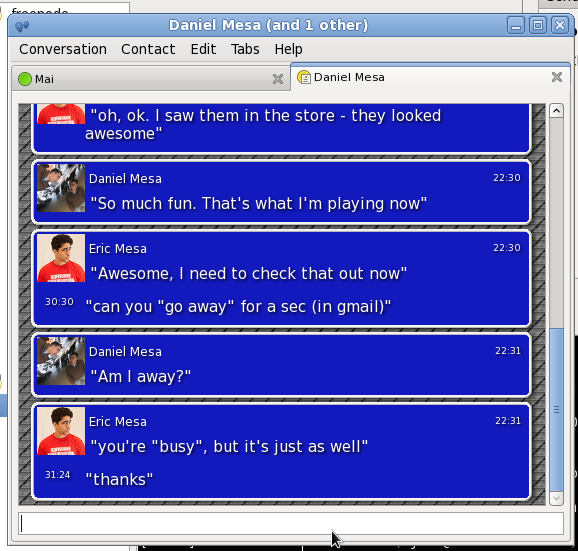 I tried chatting with someone that way (who apparently doesn’t have any other chat protocols) and I kept accidentally navigating away from the page or closing the browser. I don’t know and it is not obvious from your screenshots if you are using the jabber protocol server the facebook is running or the libpurple protocol to connect to FB chat. 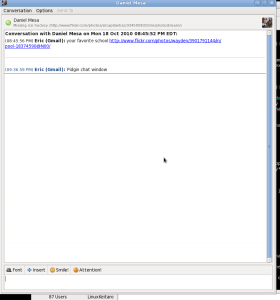 If you are using the libpurple plugin, you should really consider switching to the jabber exposed server by the FB guys. 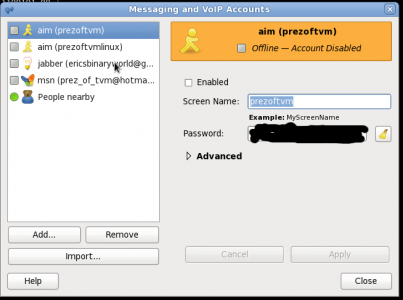 I quit using either of them earlier this year and now I use bitlbee, which turns IM from a variety of protocols into IRC traffic (it runs an IRC server to which you connect with an IRC client, and into which it delivers all your IM traffic). 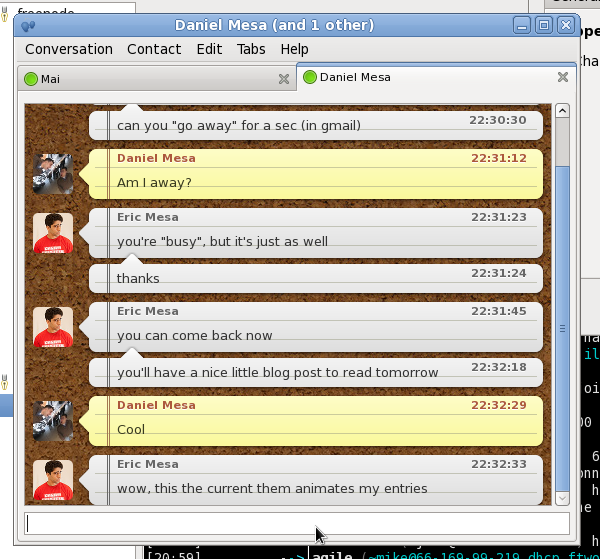 I then use the bip IRC proxy for this IRC server, just like I do for all the ‘real’ IRC servers I use. The upshot of this is that my IRC and IM traffic all winds up in the same application, which is much more convenient than having two, and I get all the benefits IRC proxying provides (I’m ‘always logged in’ so you can always leave me a message even if I’m not around, I can log in from multiple computers at the same time, I have universal logs rather than logs per system, etc). 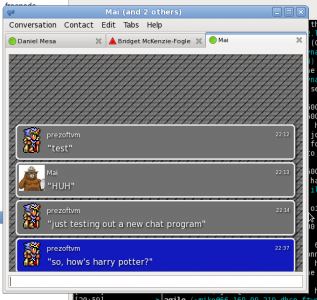 I could of course use Empathy or Pidgin for IRC, but neither of them are particularly good IRC clients, and I’d lose the benefits of proxying for IM. 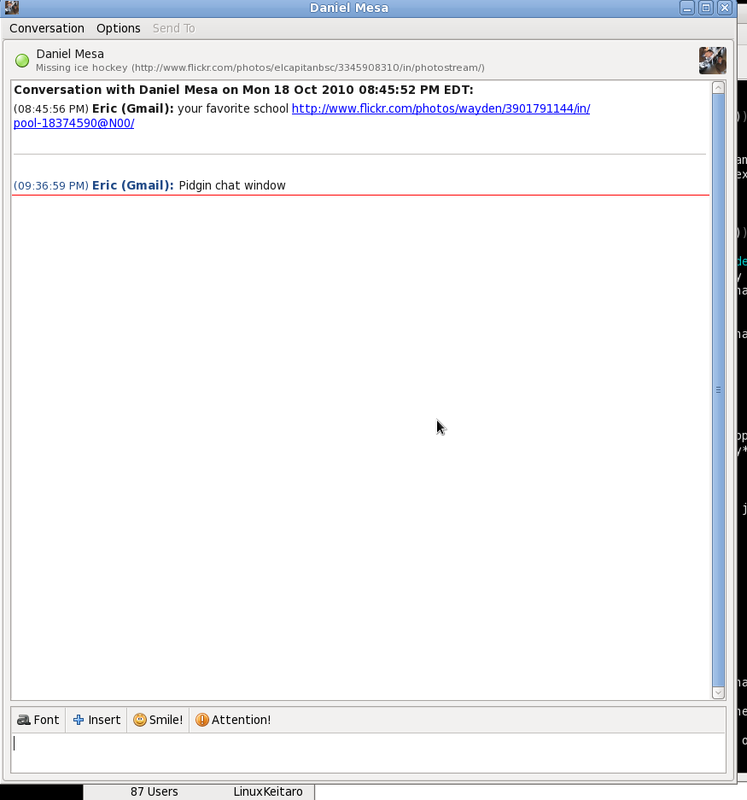 Another way to get a setup like mine is to use an XMPP / Jabber server for both IM and IRC traffic, of course. That’s insane (in a good way). Pretty awesome geek cred setup! 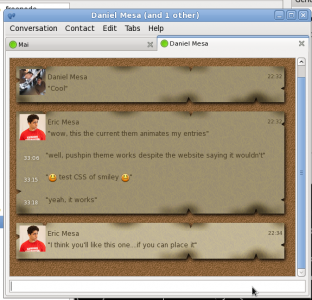 I use Xchat-gnome for IRC and I’ve been thinking of taking a look at Smuxi. it’s actually not very difficult to set up at all, though it sounds complex – the whole bitlbee / bip thing took me a couple of hours to get going (most of which is just boring writing of IRC server settings and channel lists into bip’s config file), and bitlbee is the shorter of the two. You really just install it (most distros have packages), start it up, connect to the server, and run a few commands to set up your IM accounts, and you’re done. Can’t get better than xkcd for geek cred. I’ll definitely have to check it out. 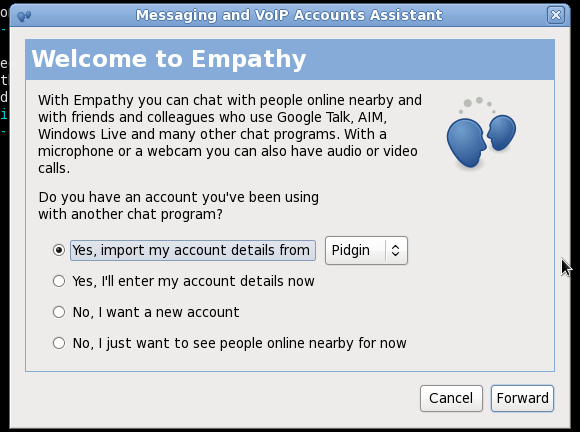 One important difference between empathy and pidgin is that empathy is a purely gui front-end tied to it’s protocol backend (telepathy) through d-bus. 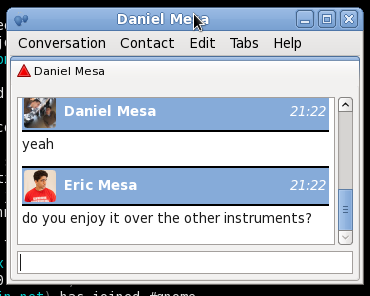 Hence, I imagine it is possible to do things with d-bus to do certain kinds of plugins in empathy. It also requires gobject introspection to build and use it’s d-bus interconnections, so it is a rather complex beast. By contrast, pidgin uses shared libraries that are directly loaded as needed for different protocols and plugins. Also, empathy protocol backends need not operate under the effective “users” login or permissions since the telepathy backend is attached purely by d-bus, where pidgin’s always do as part of the client process the shared library protocols are loaded into. 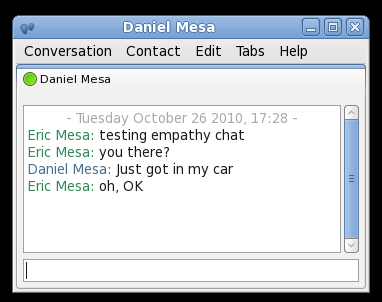 I tried Empathy since it was the default on Ubuntu 10.4. Absolutely failed. Tried adding new accounts. It would lose them. Tried to import from Pidgin. Nothing would import. Enabling the accounts did nothing. Wonder if it’s been fixed? Obviously that wasn’t my experience. Or maybe Fedora just had a better version? I made the front page of Linuxtoday.com – welcome to everyone coming from there! I tried empathy before, unfortunately I had to switch back to pidgin. The reason was the ‘invisible’ feature in empathy was not working at that time. This feature is very important for me as I don’t want to be bugged by unwanted people in my list every time. 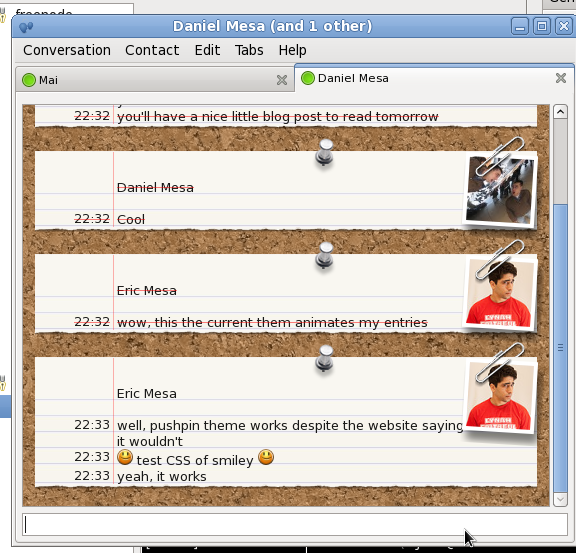 The ‘invisible’ feature in pidgin works seamless! I will give it a try again and will check if that feature is fixed. Just noticed that it doesn’t give email notification. The logic given is that “Evolution mail already has notification feature”. Well, I have many chat accounts and I can’t afford to pay for POP3 services for all the accounts. 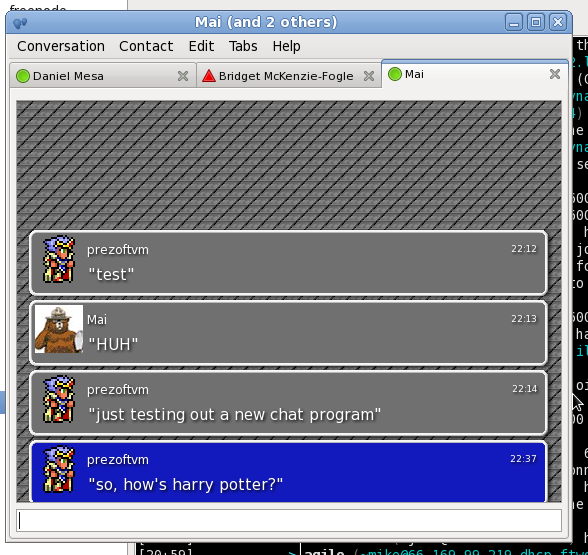 I think I can do without wonderful chat themes of empathy, at least pidgin serves the purpose which I want. Makes sense. I actually hated the email notification feature, but horses for courses. 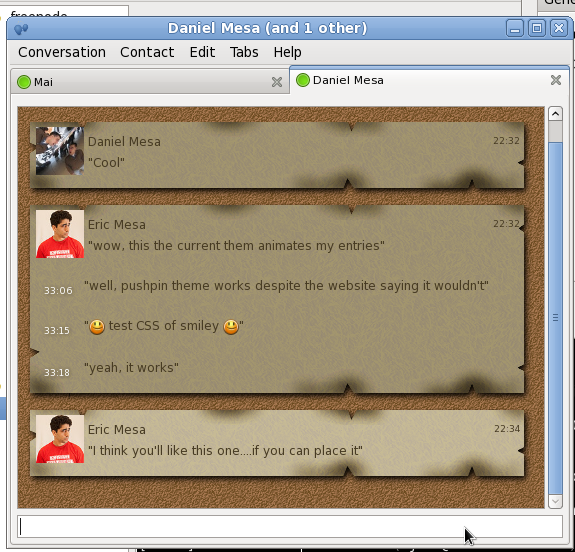 And, of course, it should work across chat clients. My big complaint about empathy last I used it was lack of OTR support. Yeah, that doesn’t concern me, but I can see how it can be a big problem if you need encrypted conversations.